Enter the Rover. This is a trike for the masses, and the masses demanded a no-nonsense, high quality ride. The Rover is designed with a higher seat for better visibility and safety, a turning radius that is tighter than most uprights, and layperson-friendly adjustments and assembly for easy transportation. For Riders Up To 400 Pounds! For the color conscious, the Rover comes with an assortment of five different decal options. We’ve designed the Rover so that all of our custom accessories fit, assuring compatibility with your other trikes or with upgraded components. The Rover is now available with a 3 or 8 speed Shimano Nexus hub for even smoother shifting, as well as with a 2 speed Sram Automatix hub that allows you to never worry about shifting again! 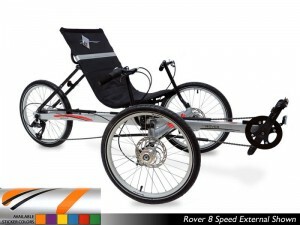 The Rover also converts to a tandem. The Tandem Attachment quickly changes your standard Rover into a tricycle-built-for-two! Convert your Rover within minutes with this nifty attachment.